Dr. Kelly began his health care career as an RN in the pediatric department at Memorial Sloane-Kettering Cancer Center, while working towards his BS degree at Columbia University. He received his M.D. degree from Stanford University Medical School in 1980, and then completed a pediatric internship at the Children's Hospital of Los Angeles and a pediatric residency at UCSF, where he served as Chief Resident. He is a Fellow of the American Academy of Pediatrics and has lifetime board certification, but voluntarily participates in the Academy’s recertification programs and exams to assure continued competency. Dr. Kelly and his wife raised their three children in San Francisco and he has long played an active roll in the community beyond that of providing direct health care for children. He has served on the boards of numerous non-profit organizations dedicated to the well-being and education of children, including The San Francisco Education Fund, The Ruth Asawa Fund, the San Francisco Child Abuse Prevention Center, the UCSF Child Care/Study Center, and the Learning and Education through the Arts Program. He was elected to the San Francisco Board of Education in 1990 and served for sixteen years, including two terms as its President. He has testified before Congress on behalf of school nutrition programs, and has lobbied actively on many issues affecting the education and health of urban children. Dr. Kelly currently serves on the Board of Directors of the Brown & Toland Medical Group. Dr. Kelly is a member of the Columbia University chapter of Phi Beta Kappa, and was voted the Distinguished Graduate Award from Stanford Medical School at his fifteen-year reunion. He has been honored by the American Friends Service Committee for his work in the Peace movement, by the Harvey Milk Democratic Club for his support of LGBT young people, and by San Francisco Bilingual Educators for his promotion of dual language programs for all students. 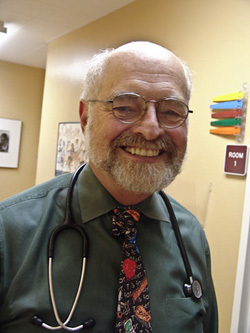 He was featured as a typical American doctor in a children's book series called "Working Worldwide", which compared the lives of Doctors in various countries throughout the world, and he is included regularly in published lists of “The Best Doctors” compiled by other physicians in the Bay Area. Dr. Kelly enjoys outdoor activities of all sorts and is a certified ski instructor for children and adults with disabilities. He is also an avid gardener, traveler, vegetarian cook, and a life-long dog and cat lover.